Earlier posts in this series on health care have documented how incredibly expensive the US health care system is (with costs almost $1 trillion more than would be the case if the US spent as a share of GDP what the second highest spending country does), and that the prices for the same procedure at different hospitals can vary by a factor of ten or even more. Future posts will explore why this is the case. But at this point it is worth reviewing how this US system of nominally competing private health insurance companies and health care providers nevertheless produces winners with truly astounding profits and personal compensation for those at the top. The focus here will be on some of the numbers, documenting how at least some individuals and firms are doing very well in this non-transparent, non-competing, system. The final section will add how this is taking place not because such insurers and health care providers are especially efficient at what they do, but rather because they are able to take advantage of a system of great inefficiency and waste. And such winners now have a vested interest in keeping this badly functioning system in place. 1) To start, one can look at the stock market returns to investors in the major private health insurance companies. The graph at the top of this post shows the ten year return (from December 2003 to December 2013) on an investment in the health insurer Cigna. Such an investment would have received an overall ten year return of 361% (not counting dividends, which would have added to this). That is, an investment of $10,000 in December 2003 would have grown to $46,100 by December 2013 (plus dividends). Over this same period, the S&P 500 index (the generally used index of the overall stock market in the US, and shown as the orange line in the graph) would have grown by a pretty good 70%. The Cigna return was more than five times as much. 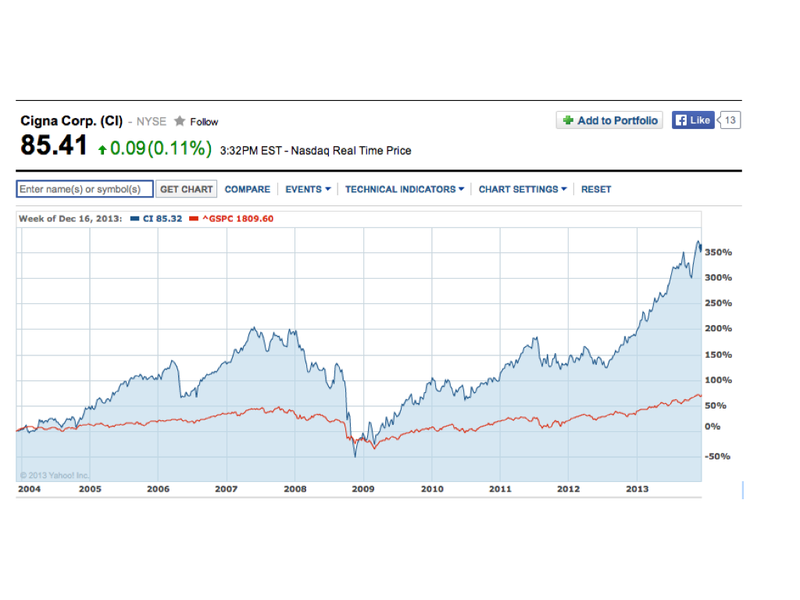 2) Other publicly traded health insurance companies have also done well. Over this same ten year period, an investor would have received a return of 145% from an investment in Wellpoint, a return of 171% from an investment in UnitedHealth, a return of 318% in Aetna, and a return of 352% in Humana. All of these are well in excess of the S&P 500 index return over this period. 3) Wendell Potter, a former head of communications at two of the top health insurers (Humana and Cigna) who is now decidedly anti-insurance, presents in his 2010 book Deadly Spin figures on how much health insurance executives have been compensated. Citing other sources that drew on corporate filings, he noted (page 139) that in 2007 the CEOs at the ten largest publicly traded health insurance companies received a combined total compensation of $118.6 million (an average of $11.9 million each). From other corporate filings with the SEC, Potter noted (page 141) that between 2000 and 2008, the ten largest publicly-traded health insurers paid their CEOs a total of $690.7 million. And in 2009, Wellpoint alone employed 39 executives who each collected total compensation exceeding $1 million. 4) But annual compensation of even $10 million or more can substantially undercount what the CEOs of these health insurers ultimately receive. According to a filing with the SEC, the Chairman and CEO of the health insurer Cigna retired at the end of 2009 with a retirement package worth $110.9 million. 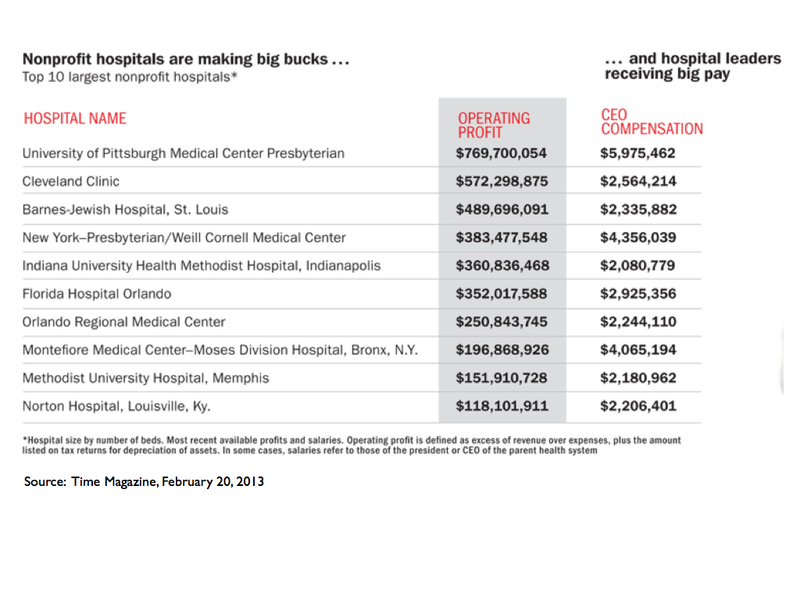 5) But the retirement package of the Cigna CEO was not the most generous among his peers. The embattled CEO of UnitedHealth Care stepped down in late 2006 after being forced by the SEC to forfeit stock options worth $620 million. The stock options in the company had been illegally backdated to make them especially profitable. However the CEO was allowed to keep stock options worth $800 million, which was in addition to the $520 million he received in compensation from UnitedHealth while he ran the company from 1991 to 2006. That is, this one individual received total compensation worth over $1.3 billion during his tenure as head of this private health insurer. 6) Hospital providers have also done well. Steven Brill, in his widely read article titled “Bitter Pill” published in Time Magazine in February 2013, calculated that in 2010 the prestigious MD Anderson Cancer Center in Houston, a non-profit that is formally part of the University of Texas system, had an operating profit of $531 million in fiscal year 2010. This was equal to 26% of its revenue of $2.05 billion that year, which is a very generous margin for a service industry. 7) Brill also noted the the total compensation of the president of the MD Anderson Cancer Center was $1.845 million that year (plus he earned more from other interests). And he reported that six administrators at the Memorial Sloan-Kettering Cancer Center in New York earned over $1 million each at that one institution. It should be added that not all hospitals are profitable. The point, rather, is that at least some are highly profitable. 9) Using records that must be filed with the government each year, the California Nurses Association found that 100 executives at non-profit hospitals in California earned over $1 million each in 2010. Four hospital groups accounted for 69 of these 100 high-earning executives, with the Sutter Health Network alone accounting for 28. The top CEO compensation was $7.7 million in that year, and four CEOs earned $4 million or more. 1) Overall Costs: First, as has been noted before and discussed in the earlier blog post cited above, the US health care system is by far the most expensive in the world, with spending as a share of GDP which is 50% higher than in the second most costly country. With almost $3 trillion being spent on health care in the US this year, that implies the US expenditures are about $1 trillion more than they would if it were spending (as a share of GDP) what the second highest country was spending. And the US is spending $1.4 trillion more than it would if the US spent what the average OECD country does. Yet as that blog post also noted, the results the US gets from such high spending are mediocre at best. The infant mortality rate in the US is higher than in any other OECD country other than Mexico, Turkey, and Chile. And life expectancy is only higher than in several OECD members with far lower income from Eastern Europe and Latin America. If the US had an efficient health care system, it would not be spending so much for such poor results. 2) Hospitals: At least certain hospitals and their CEOs receive high incomes, as noted above, but there is no indication that this comes from being especially efficient. Rather, the market in which they operate is highly fragmented, and as was documented in an earlier blog post, the variation in the prices they receive for similar medical procedures can vary by a factor of ten (or even more) between them. As any economist will tell you, a normal market should not function that way. In a normal market, one would not see much variation among prices (and what variation there is would be linked to some assessment of quality by the purchaser). Economists call this the Law of One Price. In such a market, profits will be earned by a provider who can provide the service at a lower cost (by being more efficient) and then selling it as this one price. Furthermore, these more efficient producers, earning a higher profit than others who must also sell at this same price, will then expand to provide more of the product or service at this profitable price (profitable to them). They will gain market share at the expense of the less efficient. The price will drop, and over time the less efficient will be driven from the market, leaving the more efficient providers selling at what would then be a lower price than before. In the end, only the most efficient providers will survive, and will earn a normal profit similar to that earned elsewhere and in other industries. This process clearly does not happen in the market for health care provision. Future blog posts will discuss why. But briefly, the wide variation in prices makes it possible for even high cost medical providers to survive and even to thrive, and rewards those who are skillful at managing within this fragmented system. It also rewards hospitals and other medical providers who enjoy market power vis-a-vis the insurer (by being one of only a few providers of this service within the region, for example by a hospital chain that might dominate the local market). They will then be able to demand a high price, which the insurers (and ultimately the patient) will have little choice but to agree to. Insurers, from their side, similarly seek to dominate any given local market. Which side gains the upper hand depends on which is more successful in gaining market power against the other. 3) Pharmaceuticals: The pharmaceuticals industry also illustrates how an ability to exploit the rules in the system can lead to lead to big, indeed gargantuan, profits. A good example was described in a recent Washington Post article, on the use of an expensive drug produced by Genentech for the treatment of age-related macular degeneration (AMD). AMD is the most common cause of blindness among the elderly. The Genentech drug, called Lucentis and developed through genetic engineering, is currently the most effective treatment for AMD. Essentially the same drug, called Avastin for this purpose and also made by Genentech, is used for the treatment of certain cancers. It can also be used to treat AMD, and many doctors notes it does this equally well as it is really the same drug. But Lucentis costs $2,000 per dose, while Avastin, when used in the dosage required for AMD, only costs $50 to $60 per dose. Why would any doctor then use Lucentis rather than Avastin for the treatment of AMD? Because Genentech has only sought and obtained formal FDA approval for the use of Lucentis for AMD, while deliberately not applying to the FDA for the approval of Avastin for this purpose (it is, however, FDA approved for certain cancer treatments). And in their compensation from Medicare for treating their elderly patients for AMD, the doctors will enjoy a much higher return from using Lucentis rather than Avastin since Medicare pays them a certain mark-up over cost. This mark-up will be far higher in absolute terms for using Lucentis. But by using Lucentis, the Washington Post calculates that Medicare has spent $5.7 billion more over the last five years than it would had Avastin been used. Genentech has benefited enormously by its decision not to seek FDA approval of Avastin for treatment of AMD. 4) Private Health Insurers: Private health insurers, and their CEOs, have enjoyed often staggering returns, as noted above. Such high returns could perhaps be seen as justified if these insurers provided their services efficiently and at low cost. However, the costs incurred by private health insurers (and passed on to their clients) are high. Figures on the net cost of private health insurers (i.e. administrative costs plus profits) are provided in the files on US health care costs issued each year by the Centers for Medicare and Medicaid Services (CMS). The most recent data available go through 2011. The “net costs” of private health insurers include all costs other than what the health insurers pay out to medical service providers on patient claims, and includes not only staff and office costs but also profits. For brevity, this will sometimes be referred to simply as admin (or administrative) costs. For 2011, the admin costs by private health insurers on private health insurance plans totaled $110.3 billion. The benefits paid out under these plans came to $786.1 billion. Thus the admin costs (including profits) amounted to 14.0% of the benefits paid. The CMS data also provides such costs for Medicare. The direct expenditures by government for administering this health insurance for the elderly totaled $8.2 billion in 2011, with benefits paid out of $521.6 billion, for a ratio of admin costs to benefits paid of 1.6%. However, this would be a misleading figure as a substantial portion of Medicare is now administered by private health insurers under the Medicare Advantage program. This program was expanded significantly in the 1990s and again with the passage of new legislation during the Bush administration, and in 2011 accounted for 25.3% of Medicare enrollees (see the table on page 168 of the May 2013 Medicare Trustees Annual Report). The CMS data shows that private health insurers spent $24.5 billion in administering these Medicare Advantage programs. One can then allocate Medicare payments to beneficiaries in proportion to the number of enrollees under either traditional government administered Medicare (74.7%) or under the privately administered Medicare Advantage (25.3%). Assuming that the government’s $8.2 billion of admin costs was used solely for the programs it administered directly (even though a share would have been required to oversee the Medicare Advantage program), one can calculate the admin cost shares for the directly government administered side of Medicare, and for the Medicare Advantage program. The result is that in 2011, the admin cost of the directly government managed portion of Medicare (for the 74.7%) came to 2.1% of benefits paid. But for the privately administered side under Medicare Advantage (for the 25.3% enrolled there), the private admin costs alone came to 18.6% of benefits paid. That is, private administration of Medicare programs was over nine times as expensive as direct government administration of such programs. Future blog posts will discuss further why private administration of health care insurance is so expensive. It is not simply profits, even though private health insurers have been substantially profitable. It is also high costs from a business model that benefits from incurring costs to select a pool of insured clients who are relatively more healthy and hence are less likely to make insurance claims, and to deny claims when they can. Private health insurers and at least certain of the major health care providers have been hugely profitable in recent years, with the heads of these organizations often earning very large sums. But such high profits and compensation have not been earned as a result of keeping down costs. Costs in the US are especially high by international standards. Rather, the high profits and compensation of those individuals at the top of their organizations have been made possible by a fragmented system, with little competitive pressure to bring down costs and prices. The high returns go to those who are skillful at managing within such a system. These high returns to at least some of the key players also creates powerful vested interests who benefit from a continuation of this high cost system. Thus it should not be a surprise that powerful interests fear any major reform in the health care system, such as under Obamacare. Even Obamacare, in the compromises it was forced to make in order to secure passage by Congress, was modest. It focused on extending the availability of health insurance to those currently without insurance, with most of these to be enrolled in plans from the private health insurers. There was no move to a single payer system such as from extending Medicare to the entire population, nor not even a public health insurance option which would be allowed to compete with the private health insurers. There were only limited measures to try to contain health costs. While it is still early, these limited measures appear to be having a positive effect on lowering costs, but they are not revolutionary. More fundamental changes will be needed to bring down health care costs. These will be explored in future blogs in this series on health care. Update on January 9, 2014: Following my posting of the blog above, Dr. Alex Horenstein of the Department of Economics at the University of Miami brought to my attention a paper he has prepared (with co-author Manuel Santos, also of the University of Miami) which addresses some of these same issues. It comes to broadly similar conclusions on the high profitability of the health care and health insurance sectors, but is a much more rigorous piece than this blog post. While portions of the Horenstein – Santos paper are fairly technical, and the piece is still a working paper that may be modified, there is a good deal of additional material on these issues in the paper and some readers may find it of interest. This entry was posted in Health Reform and tagged entitlements, health reform, policy, profits by aneconomicsense. Bookmark the permalink.